Interesting pitching philosophy by coach Butch Thompson at Mississippi State. He believes that using more pitchers during a game not only gives every pitcher a key role but also creates a more effective staff late in the year instead of suffering from dead arms. MISSISSIPPI STATE, Miss. — Pitching coaches have always utilized different strategies to maximize the pitching talent they have on staffs. 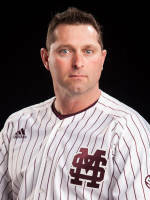 No philosophy is more progressive than what renowned Mississippi State pitching coach Butch Thompson does with Bulldog pitchers. He utilizes two starting pitchers each game (one to start the game and another a few innings later) which is followed by a setup man and closer. If needed, he will insert another pitcher or two in games if he needs ground balls or strikeouts. He has specialists for every occasion in a game.